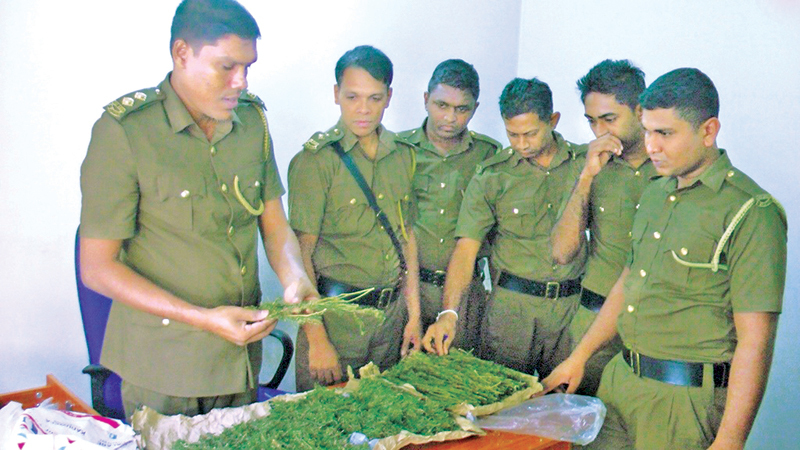 Excise Officers with the cannabis. Picture by Rahul Samantha Hettiarachchi. A suspect who was involved in selling Kerala cannabis on a mass scale was nabbed by Excise officers in Hambanthota on Wednesday evening. Hambanthota Excise Department officials said the suspect was transporting canabbis weighing around 1.5 kilos. It was also revealed that he was one of the main suppliers of cannabis in Sri Lanka smuggled in by boat from India. The suspect (37), a father of two from Hambanthota was produced before the Hambanthota Magistrate Courts yesterday.